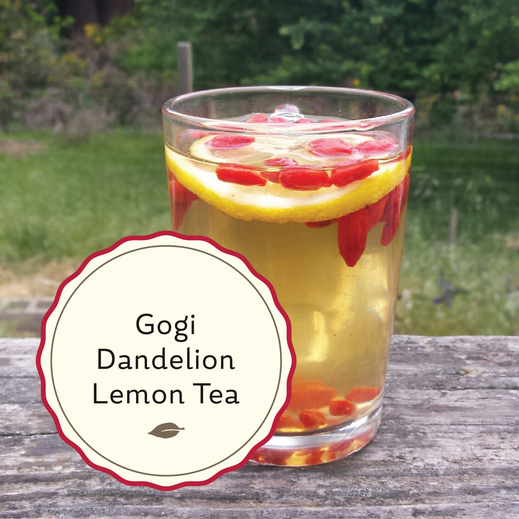 Gogi Dandelion Lemon Tea - Radiant Reality | Nutrition. Healing Arts. Inspired Living. Gogi berries have been touted by many herbalists as some of the most nutritionally rich berry-fruits on the planet. They contain all eight essential amino acids and twenty one trace minerals as well as vitamins B1, B2, B6 and Vitamin E and A. Gogi berries also contain long-chain polysaccharides that fortify the immune system. When soaked or eaten dried, gogi berries are a delicious superfood. Dandelion is a bitter herb renown for its liver, kidneys and blood cleaning properties. Used for ages in Chinese Medicine to “cool the blood”. The compounds present in this plant also work to stimulate digestion and offer anti inflammatory benefits. Lemon is loaded with Vitamin C, Citric Acid, flavonoids, B complex vitamins, Calcium, Copper, Iron, Magnesium, Phosphorus, Potassium and fiber. All these nutrients help the body replenish and support the systems. Adding in a pinch of himalayan sea salt will add in electrolytes which play a role in maintaining homeostasis in the body. Honey (if you choose) can be used for its nutritional and medicinal qualities and is quite simply delicious. Strain gogi berries and eat!